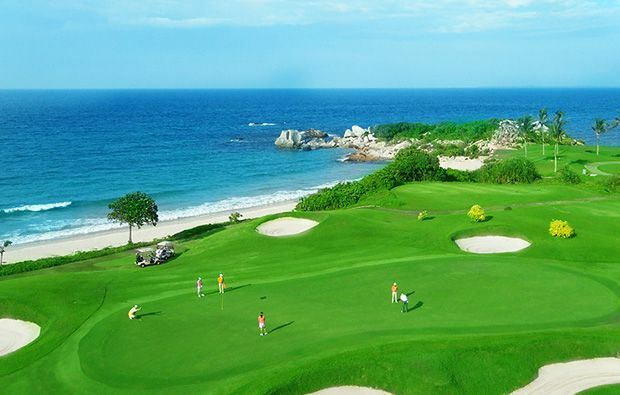 While the 9-hole Forest Course is a real treat, the main course here is the stunning Ocean Course, whose stunning vistas, tough challenge and unique design have resulted in all the awards mentioned above. The Ocean Course starts as it means to go on, with the monolithic 529 metre par-5 where your drive must avoid bunkers to one side and water to the other, your second must find a narrow landing zone between another lake and a further series of sand traps, and your third must flirt with water to find the small green. The course doesn’t ease up after that, a short par-3 where you must cross water while contending with some stiff ocean breezes followed by a tough par-4 with water extending the length of the fairway and around the back of the green. You can pick up a few shots on the relatively straightforward holes 5 and 6 before the award-winning par-5 7th and the delightful but tough 8th, a dogleg which requires a downhill approach to a very scenic green surrounded by sea on three sides. 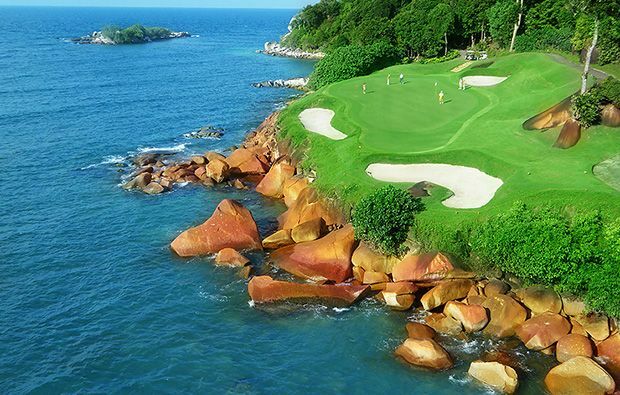 The 9th, one of Asia’s best par-3s, is a truly spectacular affair with the green sat on a rocky outcrop that juts out into the ocean. It’s a memorable end to the front nine. While not quite as stunning as the front, there are memorable holes on the back nine too as you play away from the ocean. Your approach to the par-4 11th must traverse a deep stream and avoid a pair of greenside bunkers to find safety, while your tee shot on the par-3 12th must cross more water while contending with some stiff cross-winds. 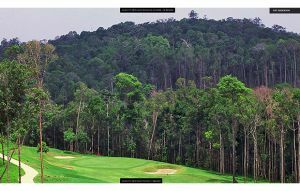 After a couple of long, straight holes with a stream running down the left hand side of both, the par-3 17th plays from an elevated tee across a valley to a very well protected, sloping green, and the round ends memorably with one of the toughest finishing holes in Asia. This very long par-4 dogleg features water to the left and dense forest to the right, and your final approach must flirt with water and sand in order to find the green and impress those watching from the clubhouse. While the Ocean Course is the main draw here, there are also an additional nine holes of the Forest Course available for play. Once you’ve negotiated the fairly straightforward par-4 opener, the 2nd is a par-4 reachable in two for long hitters willing to risk getting caught up in a long series of bunkers in the run up to the small green. The 3rd is a tricky par-5 with a blind tee shot and a water hazard guarding a tiered green, and you have to keep your nerve at the short par-3 4th, as a 100 metre wide lake is waiting to swallow up anything short. The 6th offers a further opportunity to send your ball to a watery grave as it dog-legs around a lake to small green well protected by a trio of greenside bunkers, and the tough closing hole involves driving from an elevated tee to a narrow landing zone between water and sand on either side, before playing up to an elevated final green. Overall, this is just a classy affair. The caddies are knowledgeable and helpful, the changing rooms plush and the clubhouse pleasant. 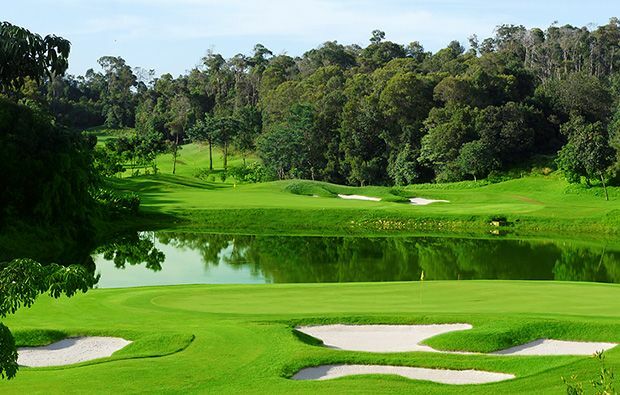 It’s unsurprising that this course is very popular with Singaporean golfers who ensure it’s busy over the weekends, so if you want to play on a Saturday or Sunday if might be worth staying at the newly built hotel so you can beat the crowds with an early tee time. 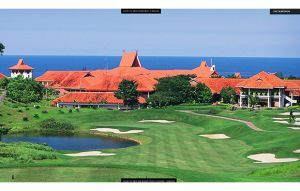 The Ria Bintan Golf Club is quite simply an essential part of any Bintan golf holiday. 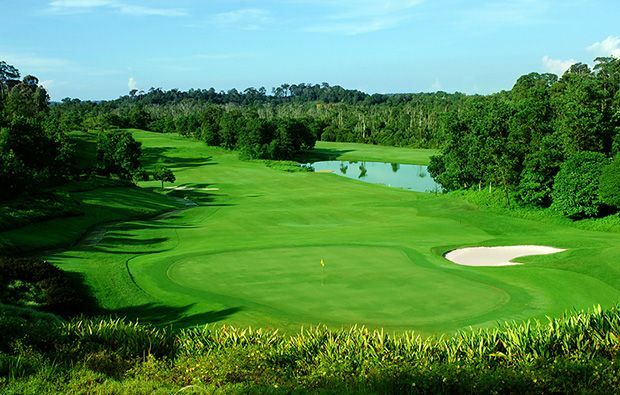 Why not let Golfsavers book the perfect tee time at Ria Bintan Golf Club using are simple booking engine which displays the exact green fee on a daily basis with any conditions clearly displayed. 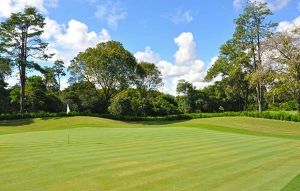 Ria Bintan Golf Club has different Services to offer. Choose a date and number or players to see the rates.